Egypt begins work on doubling the width of a buffer zone along the border with Gaza, evacuating 1,220 homes in the process. Hours after the governor of North Sinai declared that the only way to put an end to terror in Sinai is to completely raze the Egyptian side of Rafah, Egypt began work Thursday on doubling the width of a buffer zone along the border with Gaza, AFP reported. The buffer was initially planned to be 500 meters wide, but is now being expanded by another 500 meters. The authorities began evacuating 1,220 homes in the area demarcated for the expansion of the zone, security officials told AFP. "We have started evacuating the residents... but no houses have been demolished so far," one said. The decision on the buffer zone was made following two deadly attacks in October in El-Arish, which killed dozens of soldiers and were claimed by Egypt’s deadliest terrorist group, Ansar Bayt Al-Maqdis. Egyptian sources have revealed that Hamas terrorists had provided the weapons for the lethal attacks in El-Arish through one of its smuggling tunnels under the border to Sinai, thus making the buffer zone necessary. As part of the buffer zone plan, the Egyptian military is seizing and evacuating homes belonging to Gazans, but the international community has been silent thus far about the expulsions of Gazans. 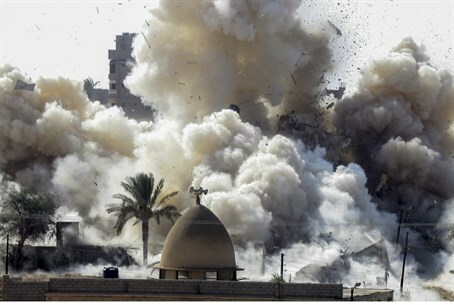 One exception is Amnesty International, which condemned Egypt's demolition of hundreds of homes and called for a halt to its "unlawful evictions" of residents. Meanwhile, the Egyptian army has also stepped up destruction of tunnels from Gaza that it says are used to smuggle arms, food and money by Hamas. It says it has destroyed more than 1,600 tunnels since the ouster of former Islamist president Mohammed Morsi, a member of Hamas’s parent movement, the Muslim Brotherhood.